I have successfully defended my Ph.D thesis titled Realistic Rendering of Clouds in Realtime on June 17, 2008. I am now working at Weta Digital, Wellington, NZ, home of The Lord of the Rings & co. 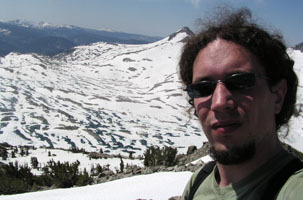 I am a Ph.D. student at EVASION, with Fabrice Neyret, stuying realistic real-time clouds simulation, and in particular convective clouds, such as cumulus clouds. I have a job of teaching assistant during my Ph.D. at ESISAR (Valence) and ENSIMAG (Grenoble), giving courses in OOP, graphical interfaces, algorithms, networking, compilation and computer graphics. I also gathered on my Teaching page some french tutorials I wrote some time ago, about OpenGL, the 3DSMAX API, file formats and some DOS low-level programming. 1999-2004 ESIEE, Paris, France. Computer Science Engineering school. 2004 EVASION, Grenoble, France : 5th year internship (Master's thesis). Real-time realistic clouds rendering. 2003 Fraunhofer Institut für Techno- und Wirtschaftsmathematik (Kaiserslautern, Germany) : 4th year internship. Vision and visualizatin on supercomputers. 2001 Lexis Numérique, Champs-sur-Marne, France : 3rd year internship. Integrating Havok into a video game, developing a 3DSMAX plugin. Find here my personal projects and favorite links.